Red Serpent is passionate, full of vitality, and very much in touch with her instincts. CHICCHAN not only bestows access to one's body's wisdom. The physical form becomes an antenna, allowing to intimately connect with mother Earth and everything around us. Initiated today, Sunday April 3, these coming 13 days will be intense. So brace yourself, this is going to be a wild ride! Even more so because the Sun at present (March 30 - April 3) is in hexagram 21, BITING THROUGH, the image of overcoming obstacles, tackling them down and bringing those responsible to justice. From tomorrow, Monday, April 4 on, for five plus days the Sun will move through hexagram #51, SHOCK, THUNDER, AROUSEL. Upon entering this dynamic oracle the Sun will approach planet Uranus. By Sunday, April 9, (7 CHUEN - Blue Resonant Monkey), the Sun will conjoin and embrace this enigmatic planet. This Sun's alignment with the Aquarian maverick could set something big in motion. There might be a huge earthquake, like some internet sources are warning about. However, and that's where things really get interesting (and that's my preferred scenario) . . . hopefully this time around all that explosive Uranian flux might manifest on levels of consciousness; redirecting this fire, transmuting it into conscious, creative and potentially mind-blowing manifestations. We're ready for the a move. Just considering, planet Uranus has been warming up hexagram #51 for the better part of 2015 and 2016 already. It's noteworthy, on Thursday, April 14, (12 CIB-LAMAT - Yellow Crystal Warrior), Uranus will enter hexagram #42, INCREASE, BENEFIT, initiating a period of stabilization, of securing and integrating what has been achieved these past two years while Uranus was wearing 'Double Thunder' (hx. #51's) hat. Uranus will be in hexagram #42 for the better part of the coming two years. Only for one short period, from December 7, 2016, to January 19, 2017, it will be back in hx. #51. Says oracle #42's guidance: "Benefit. This is the right time to go ahead to engage in an adventurous task." What adds quite a bit more fuel to the fire is 2005 discovered minor planet ERIS. She's the one who robbed Pluto of his planetary status! And ERIS is quite a gal! According to Greek mythology this is the goddess who threw the 'Golden Apple' into the round, causing the Trojan War. All in all, this is the signature of a revolution! People are just not ready to take this crap any longer! Civil disobedience is erupting and soon it might take on epidemic proportions. Truly electrifying times . . . ! There's nothing else to lose, and EVERYTHING to WIN . . . ! The 13 days of CHICCHAN, the Red Serpent. Earth's kundalini is waking up . . . a wave of motivation erupting like a geyser. No need to be afraid, good intentions are in the lead. Love is growing, taking over like a wildfire, exposing and burning down what's spoilt and rotten, purifying and transforming this world. The Red Serpent's wave is the 9th of 20. As you can see from the calendar's blueprint, we're getting closer to the center column (April 19 - May 8), which will be the 20 CORE DAYS, a powerful stretch where past and future are shaking hands, a period when big moves can be expected, when everything becomes possible. 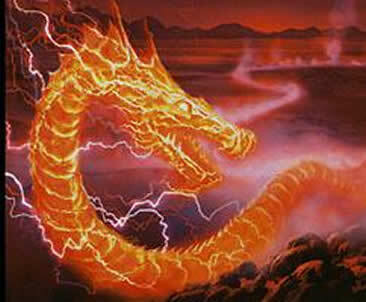 In this present wave of the Red Serpent there are ten Galactic Activation Portals. 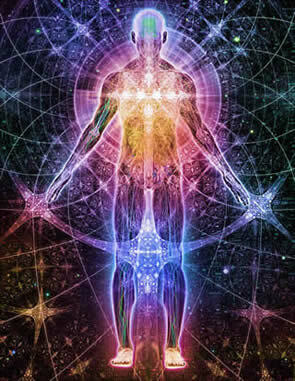 From Monday, April 4, to Wednesday, April 13, higher dimensional frequencies are raising the bar. "Portal days are energy nodes between common Earth-time and Galactic time, time-wave intersections that facilitate the reception of cosmic knowledge. On Portal days two distinct perceptions of reality are intertwined and linked together. It's the 28-day Lunar rhythm which intermingles with the Galactic heartbeat - causing for universal wisdom to spiral down into our day-to-day life." And here you can find a day by day description of the 13 days of the RED SERPENT.